The Department of Economics holds an annual Executive Roundtable on issues of regional, national, and global interest. Participants are leading practitioners in business and related fields, often Allegheny alumni. The Roundtables bring students together with distinguished business leaders whose perspectives and experiences create educational and career-related value. The Executive Roundtable is supported by the Earl W. Adams, Jr. Endowment, established by Allegheny College Trustee William H. Brown, Jr., Allegheny Class of 1980, in honor of Professor Earl William Adams, Jr. – teacher, mentor and friend. What started as a simple phrase of support for survivors of sexual assault in 2006 has evolved into the viral #MeToo movement that has shone a spotlight on the culture of sexual harassment in some American workplaces. Sexist comments, unwanted sexual advances, and demands for sexual favors have contributed to a culture in which both women and men report lost work opportunities, reductions in income, demotions, and other forms of career impairment. In this roundtable, a group of experts will discuss the #MeToo movement and its impacts on the future of business, jobs, and careers. Jason MacDonald, Associate Professor, Political Science, West Virginia University. April 4, 2016 4:00 to 5:30 p.m. The Center for Business and Economics hosts the Executive Roundtable to address an important issue in business and economics. Few public policy issues in the United States have been as politically contentious and polarizing as the ongoing immigration debate. Americans across the political spectrum and socio-economic strata are sharply divided over what should be done about the 11 million unauthorized immigrants in the country and how, more generally, to redesign our outdated national immigration policy. Panelists explored questions that are idiosyncratic to local communities and regions across the country. For example: To what extent, for instance, are immigration issues salient for Western Pennsylvania? What is the region’s immigration profile, and how is it different from other regions? Are there unique attributes of Western Pennsylvania that call for a more nuanced approach to immigration? 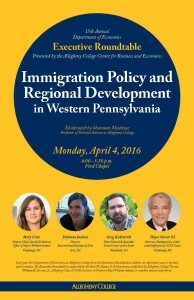 How might restrictive immigration policies affect Western Pennsylvania? Would a more expansive approach to immigration boost or undermine the region’s economy and social cohesion? Is there any role for local/regional public-policy makers, the organized business sector and economic development agencies in the immigration debate? View 15th Annual Executive Roundtable video. For decades, higher education has been the cornerstone of the modern American dream, as millions of Americans – rich and poor – have achieved a better life through the power of a college degree. Educational opportunity has been weakened in recent years, however, as state and federal funding have been slashed, tuition costs continue to rise, public K-12 schools fail and working-class incomes have stagnated. All of these factors have made it difficult – if not impossible – for many students to successfully complete a four-year degree. How we collectively deal with these issues will be vital in shaping the future economic prosperity of our country. View 14th Annual Executive Roundtable video. In the midst of a national “wageless recovery,” the Roundtable focused on a number of key questions: With recent gains by local manufacturers, what can be done to return the region to its status as a manufacturing powerhouse? With state legislators debating the potential implementation of a state right-to-work law, what is the role of labor unions in creating and protecting “good” jobs? As local firms grapple with skill shortages in critical positions, what can be done to train and develop the area’s workforce to meet the needs of employers? How will national regulatory – and local hospital and insurance – changes affect employment in the region’s health care industry and the economy generally? What is the potential wage and employment impact of the natural gas reserves in the Marcellus Shale? Bill Adams ’89, Senior Counsel, Labor, Employment and Benefits, PPG Industries, Inc.
View 13th Annual Executive Roundtable video. Few public policy issues have generated as much controversy as the burgeoning U.S. deficits and debt as dramatized by the recent “fiscal cliff” debate. Opinions on the related issue differ among economists, policy makers and politicians across the ideological spectrum. Some have argued that Federal debt and deficits pose long-term socio-economic and political dilemmas for the U.S: that current levels are unsustainable, take up resources that would have been invested in America’s future, crowd out resources that are needed for investments in the economy, and reduce the ability of the U.S. to act decisively on global issues. Others have claimed that debt and deficits arising from the economic crisis and a sluggish recovery can actually expand the country’s future well-being by increasing current employment, investment and resource utilization. The Roundtable focused on the Pennsylvania boom in exploiting the Marcellus Shale as a source of natural gas, along with prospective development of other deep natural gas shales. While some perceive the Marcellus and similar formations as solutions for the region’s energy and economic challenges, others express concern about the long-term effects of fracking on aquifers, ecosystems and community life. Key questions included: What is the magnitude of the Marcellus Shale as a source of energy? What are some of the basic scientific and technical issues associated with exploration and processing of natural gas from the shale? What are the potential economic benefits and risks? What are the implications for the environment and local communities? To what extent might regulation reconcile the economic benefits and environmental costs, and what sort of regulatory framework would be needed? The video may be viewed here. The Roundtable explored the role of American corporations and financial institutions as global citizens, with its starting point the challenge posed by the United Nations through its “Millennium Development Goals,” . . . that institutions and decision-makers in developed countries make great strides toward ending world hunger and poverty and promoting health, education and environmental sustainability.” With a focus on corporate social responsibility and social impact investing, the Roundtable addressed possibilities and constraints for private sector participation in the Millennium Development Goals. The video may be viewed here. Featured topics during this Roundtable included: what defines an entrepreneur; personal entrepreneurial journeys’ sources of innovation and ideas; the growing difficulty in raising start-up capital; how to prosper in tough economic times; and the impact of rising health care costs. Mark Hanaway, Vice President and Director of Sales and Marketing, Tech Molded Plastics, Inc.
A the time of this Roundtable, America’s economy was experiencing one of the most traumatic financial crises in history. The worst financial crisis since the Great Depression has led to unprecedented levels of home foreclosures, the collapse of major financial institutions, a drastic fall in asset prices, a loss of confidence in the financial markets and uncertainty about the future of the U.S. financial sector. Roundtable panelists considered question such as: Is the economic crisis a manifestation of the imperfection of U.S. financial markets? Is it a result of the ineffectiveness of the country’s regulatory agencies? If so, is the establishment of new regulatory schemes warranted? Does the global economy need a new financial architecture to head off future crises? How should the relevant players in the financial markets respond to future crises? Is “Bailout economics” good economics, both for market stability and “Main Street?” What should be the financial priorities of the new administration? John Stilley, President, Amerikohl Mining, Inc.
Russell Schetroma, Director, Culbertson, Weiss, Schetroma, and Schug, P.C. Gregory Antoun ’73, President, ChipBLASTER, INC.
Kevin Baird ”84, President and CEO, Qualitor, Inc.
Daniel Jepson, President, Jepson Precision Tool, Inc.
Karen A. Ubelhart ’77, Equity Analyst, Government of Singapore Investment Corp.
Kimberly Tillotson Fleming, President, Hefren-Tillotson, Inc.
William S. Demchak ’84, Vice-Chairman and CFO, PNC, Inc.
Martin Pfinsgraff ’77, Chief Operating Officer, iJET Travel Intelligence, Inc.